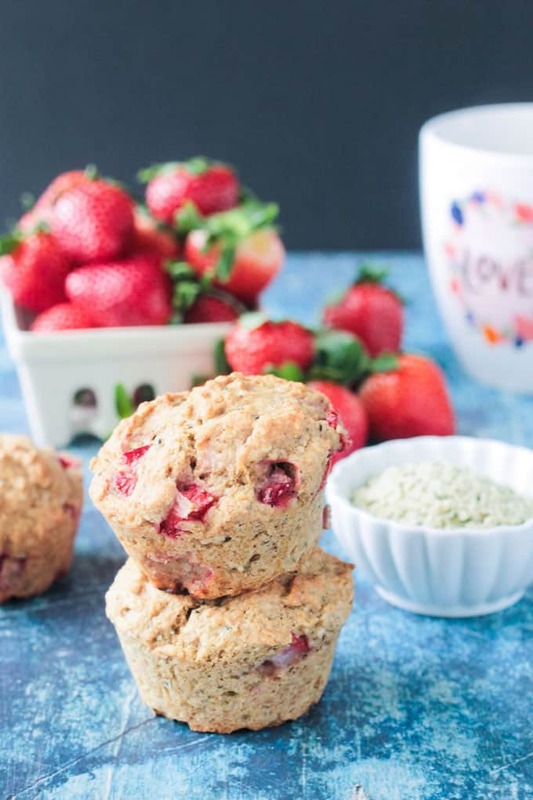 Lemon Strawberry Protein Muffins – crispy tops, soft centers, packed with protein and juicy strawberries, you’ll be reaching for these delicious muffins morning, noon, and night! I love baking up a big batch of muffins. It’s easy to pack in the nutrition while still allowing them to taste almost like dessert. They’re perfect for grab-n-go breakfasts, after school snacks, pre-game energizers, or healthy dessert. I even pack them in my kids’ lunch boxes sometimes instead of a sandwich. 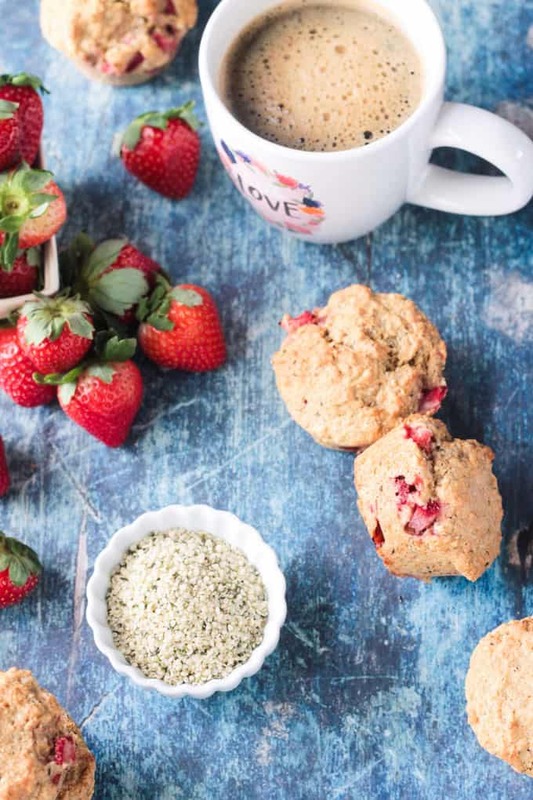 These Lemon Strawberry Protein Muffins are made with whole grains, fresh strawberries, unrefined coconut sugar, and superfood chia and hemp seeds. They boast 10 grams of protein in 1 muffin and will leave you feeling full and satisfied. The recipe comes from the new cookbook, The High-Protein Vegan Cookbook by Ginny Kay McMeans. Keep reading for the recipe for these yummy protein muffins and a full review of the cookbook. The next time someone asks you “But, where do you get your protein?”, you can just hand them this book! As long as you are eating a good variety of plant based foods, you will have no problem meeting your protein requirements. However, for those times that you want to make sure you’re getting enough, this book has your back! In this book, you’ll find 6 chapters with more than 125 hearty recipes sure to keep you full, fueled, and happy. From breakfast to dinner and everything in between, including the all important snacks, there is something for everyone in this book. Along with all of the delicious, protein-packed recipes, Ginny also explains what protein is and why our bodies need it. You’ll find a handy list of the Top Vegan Sources For Protein in the Introduction section, including serving size and grams of protein per serving. 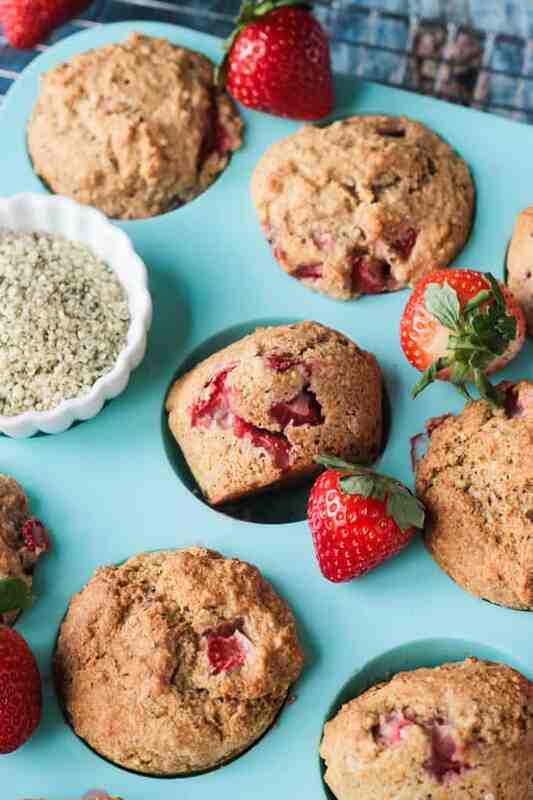 Breakfast Power ~ Warm Maple Protein Oatmeal; Blueberry Tofu Pancakes; All-in-One Skillet Breakfast Hash; and these Lemon Strawberry Protein Muffins (recipe below). Hemp seeds, or hemp hearts, are from the same species as cannabis, but a different variety. You will not get high eating hemp seeds! They are, in fact, super nutritious. Hemp hearts are high in essential fatty acids, vitamin E, potassium, calcium, iron, and zinc. They also happen to be an incredible protein source. 25% of the calories in hemp seeds come from high-quality protein. They contain all of the amino acids necessary to be a complete protein. We love hemp hearts in our house and we sprinkle them generously on a number of dishes. I use them to make my Tofu Hemp Burger, Mango Kiwi Smoothie, and we sprinkle them on our very favorite Avocado Toast. 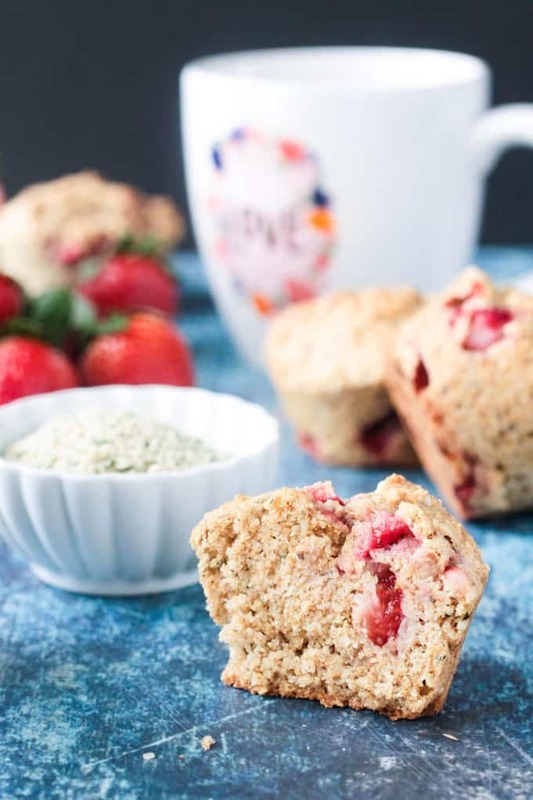 I love the idea of adding hemp hearts to muffins, so when I saw the Lemon Strawberry Protein Muffins in this book, I just had to try them! They did not disappoint! I hope you love these dairy free Protein Muffins as much as we do. If you try them, please come back and leave me a comment below with your feedback and star rating. 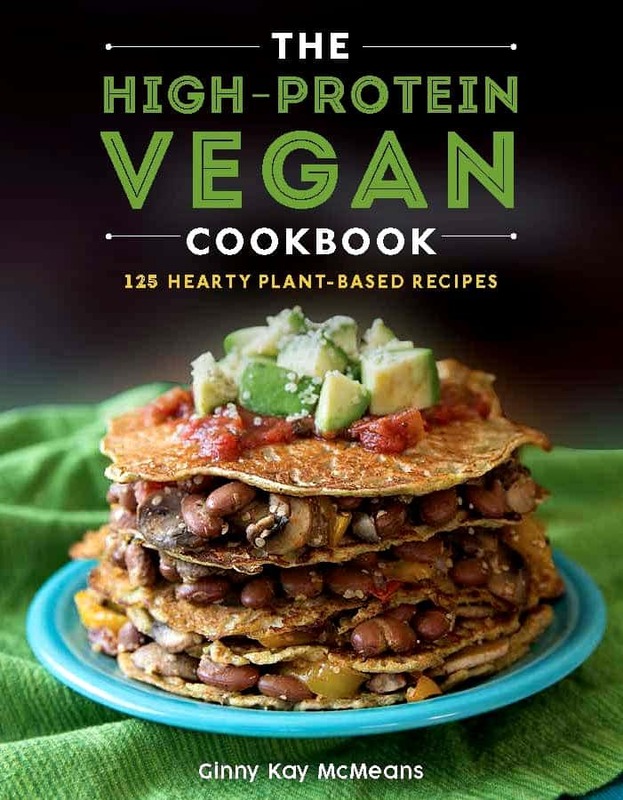 And don’t forget to order your copy of The High-Protein Vegan Cookbook! are added for that contrasting fruity touch that we all crave now and again. Grease the inside of a six-cup muffin tin and set aside. Mix 1 tablespoon ground chia seeds together with 3 tablespoons water and set aside. Using an electric mixer, beat together the butter and sugar in a large bowl until light and fluffy, about 3 minutes. Add the chia seed mixture and mix again. Add the milk and lemon juice. Mix well. Add the flour, baking powder, baking soda, salt, hempseed, and the remaining tablespoon ground chia seeds to a medium bowl. Mix. Add the flour mixture to the wet mixture and beat until just combined. It will be a sticky batter. Divide the batter between the muffin cups. Fill at least three-quarters full. Note from Veggie Inspired ~ I tested a butter-free version knowing that I would have readers ask about that. I used 1 small smashed banana in place of the butter and it worked great. The texture was a bit more dense and a little more "springy" than the recipe as written, but they were still yummy. Also, note that I got 9 muffins, instead of 6, both times I made them. I cannot WAIT to make these muffins – one of the recipes I have marked to try. beautiful photos, Jenn! Thank you, Kristina! I think you will really enjoy them! The perfect amount of sweetness! These really DID turn out PERFECT…didn’t they! VERY NICE!! Yum! What a wonderful review! Thank you so much and your post is packed full of so much other interesting information. I also loved these muffins and I’m so glad your kids did too. Your photos are beautiful! I’m so glad you like it, Ginny!